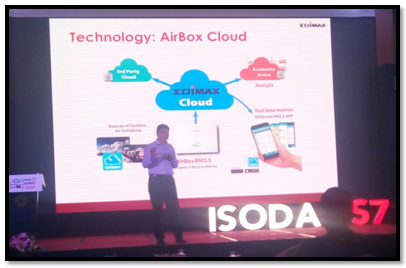 NEW DELHI, India – February 23, 2017-Edimax Technology, a leading provider of premier networking solutions participated in the Info Tech Software Dealers Association (ISODA) Tech summit 7 event which was held at Ho Chi Minh City, Vietnam from 16th to 19th February 2017.The event witnessed around 90 attendees from various countries across the world and displayed innovative products from different vendors. ISODA aims to bridge the gap between Software Manufacturers, Distributors and Dealers, uniting and helping them to foster fellowship amongst all trade members and communities facilitating a joint representation and trying for resolution of issues arising with vendors & distributors. ISODA helps by providing access to all relevant information to its members on a diverse subject such as various tax laws from custom laws, new technologies, business trends, sales organization, aligning partner across the India to address their growing issues to serve customer spanned across the country. ISODA platform also engages with Partner-Eco-system for positive closure of issues faced by members and help them in identifying new opportunities and prepare for threats. With over 30 years of experience, Edimax has grown to be among the world’s leading manufacturers of advanced network communication products. Edimax is staunchly working towards the design, development, manufacturing and marketing of a broad range of networking solutions. Edimax has wide range of consumer and business solutions and received ISO 9001 and ISO 14000 certification in 2003, won Computex Design & Innovation Award and also ranked in the top 35 most valuable international Taiwanese brands by Interbrand 2014, iF Design Award 2014, Red Dot Design Award 2015 and Taiwan Excellence Award 2016.